Obviously this has been the biggest eyesore in the kitchen. This is just a small area between the refrigerator and the pantry. It became the catchall. It now houses my recipe/menu/planning tools and my household management/organizing files. My market bags now have a home on my shelves by the back door so that as I walk out the door, ideally I will remember to grab them and put them in the car for the next trip to the grocery! What have I learned from this challenge? First of all, I have learned that I am not alone. That each of us have decluttering needs from small to major projects. I have learned that decluttering does not have to be overwhelming. I have learned to take one step at a time, one foot in front of the other. I have learned that if I don't finish the decluttering project right now, that is ok. It will be there tomorrow and I can deal with it. And I have learned that decluttering can be planned and UNplanned and still be successful. Always have a plan - a goal but be prepared for the unexpected. (i.e. an unwanted critter! lol) Decluttering doesn't have to stop because you have guests - adjust your expectations for that time. Giving everything a home, a place, helps make your life easier. I used to declutter - from one area to another area! That wasn't really helping. It still left me stressful and unhappy! It was like the wound that wouldn't heal! Decluttering is not MOVING things, it is putting them in their place and removing what doesn't belong or no longer works for you. I have a close friend that keeps a lovely house and she has a friend that keeps even a MORE lovely house if that is possible. She asked her friend her secret one time. Linda answered her. "I never walk past something out of place without picking it up and putting it away, whether it is a weed in the flower box by the front door or a spoon out on the counter." I kinda looked at Billie, my friend and said, I would be running around forever if I did that!! I have found out not so. Seeing something brings on an automatic decluttering response - pick it up and put it away before it grows! lol My life is freed up so much more because things are decluttered, things are simplified and things have a designated place. Now mind you, I am not done yet. I still have a couple of major areas to deal with, but I am not overwhelmed with it and I have my written plan and my mental plan to deal with it. I love to craft but crafting often made me cranky because I knew that things elsewhere were not taken care of. Not so anymore. I am free to craft because things are in their place and not calling me to take care of them. I have learned my decluttering style is basically NOT having a place/home for things. Bringing one item in, not putting it away and not getting rid of something to make place for the new. These are the habits that I am working on applying to my life. I really want to thank Marcia, The Organising Queen, for starting this challenge and she is going to continue to have a weekly challenge for us. Marcia, you have been such a help and motivator and encourager to me. I just can't thank you enough! You are a wonderful new friend and "decluttering coach!" Somehow I found your blog when I really needed it in my life!!! Thank you, again!! And to EACH of the gals that have accepted this challenge and posted about it on their blogs, I thank you! Each of you have been an inspiration and encouragement to me in this journey. I hope that we will continue to encourage and keep everyone motivated when needed! I look forward to seeing how you will continue to be involved in our journey. This is not the end, it is the beginning! Tis the season! :) Football games, hockey games and good friends to watch with and enjoy! This is a great recipe from a Pillsbury Cookbooklet I got several years ago. Combine cream cheese, cheese, onion, mayonnaise, garlic powder and chiles; mix well. Stir in dried beef. Spoon into 1 or 1 1/2 quart slow cooker. Cover; heat on low setting for 1 1/2 to 2 hours. Just before serving, sprinkle pecans over top. Dip can be kept warm in slower cooker for up to 1 hour. Serve with crackers. The other side of the sink! Here is the other side of the kitchen sink. Under the papertowels are my tea cups that I use for brewing and an ice tea carafe that I use with ice in the middle. These will probably end up somewhere else but for now they are here. My husband's diabetes testing strips will probably find their way to the cabinet above. Also, a STACK of cookbooks/cookbooklets that I am getting rid. I copied a FEW recipes that I will put into my organizer notebook to try. These will go to my daughters, daughter in laws and some friends. What did you declutter today? Declutter Challenge - Week 4!!! Well, we are down to the final stretch of the challenge but not the end of the journey. I finally got my laundry closet done!!! Well, there is space here so I can still grow! :) Also one pic is of the kitchen counter to the left of my sink. There will be more pictures of the other areas as I get finished. I decluttered each day, but I do have to say having the baby took more of my time and I wouldn't give that time up for anything!! I am happy with how the way things are shaping up and looking. The bag is not ALL that was decluttered, it was just what I managed to snap a pic. Several things were added to the Goodwill box. A slicer that I never use. I slice my tomatoes and onions the good old fashioned way, a hot pad mitten that was too small for me, etc. To see what others have been decluttering this week, click here! Today is my middle daughter's birthday! She has the unique honor of having my oldest and youngest grandchild! Again, I am blessed to have my daughter in my life. She is a fun loving, kind and caring person. She has not always had an easy adult life and money has been tight. She is a very frugal person and has adapted to living on a shoestring many times. Even in her financial straits, she still finds the heart to share and give to others. I have always been impressed by that. One incident in particular really exemplifies that. Even though money was VERY tight with her, after only living in her home for less than a month, her older neighbor's wife went into the hospital. She was having us over for birthday dinner that night. She made an extra casserole to take to the neighbor because his wife was not there to look after him. Kristina gives out from her heart. I am blessed to have her as my daughter and mother to my grandchildren! Click here to see more Wordless Wednesdays! I read this today in my email from ineedmoretime newletter. This was an inspiration to me. "Anything that doesn't serve a positive purpose in my life...making room for things that feel happy to me." This has probably been said in other ways in our challenge but today this really hit home with me. First of all it helps me in making my choices as to what stays and what goes! Recently, I shared with Marcia that I had a struggle over getting rid of a perfectly good UNUSED juicer! A good thing but I didn't use it. I struggled like the demon on one shoulder and an angel on the other! The juicer is a good thing and COULD be a positive BUT, I don't use it! Will I ever use it? Well, I have had it for 5 years and haven't so what is going to change in the meantime to make me use it? Unless I win the lottery and can quit work, absolutely nothing. So it is NOT a positive and therefore it is out. I think I am going to print that quote out and laminate it and put it in my planner. I may even make it the cover! A reminder. And it doesn't stop with the physical clutter. A few others have mentioned mental clutter. 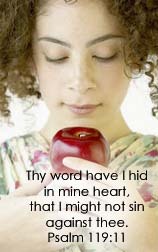 I need to go thru and get rid of negative thoughts and spend more time filling my mind with positive thoughts which the majority for me come thru the Scriptures. I still have a pile on my kitchen counter from my decluttering kitchen/laundry closet project. I think that I will be able to get thru more of it tonight because I have just equipped myself with the tool (the quote) to help me make the right choices for me. I thought this was cute. Be a nice gift to tuck inside a note card. 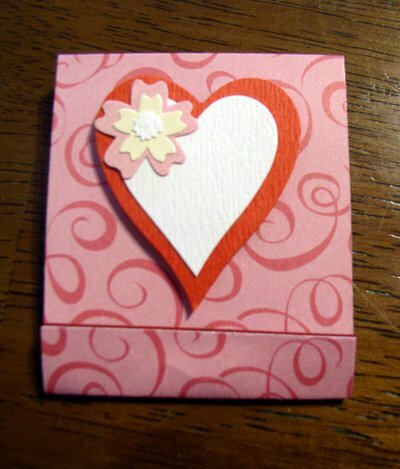 Don't have to be restrained by the heart theme, any fun paper and stickers would work. Click here for the tutorial. Sugar Cookies don't get any better than this! This makes a lot of cookies! I got this cookie recipe from my Aunt Elma. Aunt Elma was the best cook in Roseburg, Oregon and probably the state of Oregon and more! She is a woman to be admired. She certainly never was idle! Cream the top 4 ingredients and then mix in the rest. Drop by spoonfuls on cookie sheet and flatten with glass dipped in sugar. Bake at 350 for 11 minutes. This makes a very large batch. I love these cookies and love that they do NOT have to be rolled! You can sprinkle with more sugar before baking if you like or frost when they are cooled. Menu Plan Monday - a bit early! Stir in barbecue sauce and chili beans. Heat to boiling. Reduce heat to low, simmer uncovered 10 to 15 minutes, stirring occasionally, until slightly thickened. Spoon mixture onto bottoms of buns; sprinkle liberally with cheese. Top with tops of buns. Cook beef over med-high heat 5 to 7 min, stirring occasionally until thoroughly cooked; drain. Stir in taco seasoning mix and water. Reduce heat to medium. Cook uncovered 2 to 5 minutes, stirring occasionally, until most liquid is absorbed. I large bowl mix sour cream dip and salsa. Stir in beef mixture, bacon and olives. Gently fold in tomatoes and lettuce. Divide salad among 4 individual plates. Sprinkle with cheese and ships. Serve immediately. Heat oven to 425. Spray cookie sheet with cooking spray. In med bowl, stir Bisquick, cornmeal and milk until soft dough forms. Drop dough in 4 mounds on cookie sheet. Pat each mound into 5 inch round using fingers coated in Bisquick mix; pinch edges to form ¼ inch rim. Prick bottoms with fork. Bake 8 to 10 min or until golden brown. Place on individual serving plates. Meanwhile in 10 inc skillet, cook turkey over med-high heat 5 to 7 minutes, stirring occasionally, until no longer pink. Stir in taco seasoning and water. Cook uncovered about 5 minutes, stirring occasionally, until thick and bubbly. Spoon mixture onto baked rounds. Top with cheese, lettuce, sour cream and taco sauce. Heat oven to 400 F. in skillet, cook beef over med-high heat 5 to 7 minutes, stirring occasionally until thoroughly cooked, drain. Stir in oregano, basil, tomato paste and ½ C of mozerrella cheese. Spray 8 inch square (2 qt) glass baking dish with cooking spray. Layer cottage cheese and parmesan cheese in baking dish;. Spoon beef mixture evenly over top of cheese. In med bowl, stir Bisquick mix, milk and eggs with wire whisk or fork unti blended. Pour into dish. Bake 30 to 35 minutes or until knife inserted in center comes out clean. Sprinkle remaining 1 ½ C mozzarella over top. Bake 2 to 3 minutes longer or until cheese is melted. Let stand 5 minutes before serving. Garnish with tomatoes and basil leaves. Day 23 - Declutter - So far today! So far today! I have fed the baby thrice - 3 AM and 6 AM and 9 AM - bathed her. She is waking up now I hear her..... I have organized the baking cupboards and the container cupboards... YIKEs... I have WAY too much stuff! My counters are awful right now... but not going to let it over whelm me... I have tomorrow too! But thought I would show you so far. The blue bucket has lunch size containers for storing leftovers and other goodies that will go into our lunches. I am always looking for the right size and can never find them. You won't believe what I found!! There are some Tupperware microwave containers that I forgot I even had! I started to keep them, then I said, NO! I have not used these for almost 4 years WHY? I dug a couple of the plastic bags out for garbage and give away. Will take a picture of that later. Right now my sweet granddaughter (She has been out helping her papa most of the morning) is making us all a sandwich and I am going to see about the baby! A break feels good. A FULL plastic sack of plastic sacks! The empty box from the vacuum bags full of some paper clutter and a couple more handled plastic bags underneath, one from Marie Calandars. They are so nice I hate to throw them! But have I used them!!!????!!!! NO!!!!! And here are my two "helpers"!! :) In this picture, Spot has actually put his paw up behind Brittanee's head and is pulling her towards him like to give her a hug. It was very sweet!!! I really thinned out a few drawers this week and tonight! These are just 2 of the drawers. bottom drawer is likely to change as it has my hand mixer in it and I am now changing my original plan in the kitchen. I am now going to have all my baking items, including mixers and bowls in one area. This is now going to mean moving the microwave and the countertop convection oven from their present home. I am sure I will get a pic when done! This has been a wonderful challenge and if you haven't seen it yet, click here and go on over and see what it is about! Still 11 days to go. I am excited to see what I and others will accomplish! I am really hoping to finish the kitchen and the laundry closet this weekend and then the focus will become the office. No matter where you are in decluttering in your life, I hope you will come and see what we are doing and join in the journey!!! What have YOU decluttered this week! Another night of paper clutter. I cleared out my bill pile tonight, paid bills and got rid of this including a JoAnn's flyer .... I DIDN"T USE THE COUPON! OUCH! ... lol.. oh well, guess that is money still in my pocket then. I also cleaned out 3 drawers in the kitchen - the towel drawer, the plastic wrap, baggies, alum foil drawer and the bottom drawer that has my electric knife and hand mixer in it. My grandbaby and her oldest sister are here now and will be for a week. I am still going for the kitchen this weekend as my 13 year old will be a HUGE help! Now it is just about time to wake the baby and feed her one more time and then hopefully she sleeps thru the night!! NO, I am not super grammy! I hope I haven't bitten off more than I can chew! lol. I know I couud do this with out Brittanee to help! This is pile of junk paper from the pile of paper that I went through! I also rearranged the gadget/utensil drawer in the kitchen. I have mapped out what I want to do this weekend. I am moving my "baking" cupboard to a different location and relocating appliances on the counters and such. :) Hopefully I will get the appliances out to the laundry closet this weekend. I am really pleased what I have accomplished in this challenge!! It is just the beginning of the journey for me! What have you decluttered today? This is a cute holder for a gift card. For the full tutorial, click here. I found this over at Tipnut.com and found it very informative! I like to laminate kitchen reference charts and tape to the inside of the kitchen cabinets. On thing that I do is to a plastic sleeve with sticky back (purchased from an office supply store) and attach to the inside of the kitchen cabinet. I put my toaster oven information, my blender information, other kitchen appliances in them for handy reference. Use plastic bins or tubs to hold all pouches of dry soup mixes, seasonings, etc. Keeps them neatly contained in one place, store in the pantry or cupboard. Insert kitchen reference charts and favorite recipes in clear plastic sleeves then hang on the inside of kitchen cupboard doors for easy access. They can easily be wiped clean as well as keeps often used info at your fingertips (Kitchen Printables: Kitchen Measurements Equivalent Conversion Chart, Recipe Ingredient Substitutions & Equivalents Chart and 34 Handy Kitchen Measurement Hacks & Tidbits). Use a large crock or container to hold your most used kitchen utensils and set it on the counter for easy access (wooden spoons, spatulas, large soup ladles, etc.). Also helps to keep the large utensils drawer better organized since less is packed inside (use drawer dividers or shallow baskets in these drawers, helps keeps things better sorted). You could also hang a hanging wall basket to stash lightweight larger items (as in the picture above). Pack lids for plastic containers or Tupperware in a clear plastic tub or large ziploc bags, you’ll be able to see easily just where the lid you need is. Keeps them contained instead of rampaging foot loose and fancy free through your cupboards. Spices can take up a lot of precious pantry or kitchen cupboard space–get them off the shelf and up on the wall. Mount a spice rack inside the pantry on a wall or hang a narrow basket shelf inside the pantry door (not over the stove, heat isn’t good for herbs and spices). You can get the knife block off the counter by installing a magnetic bar along a back counter wall–will hold your knives securely. You could also install a magnetic bar on the wall of your pantry to hold small tools you like to keep close at hand (screwdriver, pliers, etc.) or make a hanging tool organizer. Plastic lazy susans are a great organizing help in the pantry or small kitchen cupboard. Store like things together and you’ll know just where to grab what you need. Use cup hooks: Affix to the inside of cupboard doors and on pantry walls. They’ll hold things like measuring spoons, large bbq & kitchen utensils (with straps or holes for hanging), potholders, etc. Use small ziploc bags to hold small like-items together (like twisty ties, corn cob holders, etc.) then store all the bags together in a small plastic basket or tub. Utilize the space underneath hanging cupboards, you can install a paper towel holder, plastic wrap holder, knife holders, etc. Tip For Organizing Measuring Cups: Keep measuring cups stored in baking supplies for handy access. Pot Lid Taming Options: Use spring-tension curtain rods to make dividers in drawers and cupboards or try a dishrack to organize lids. Simple Tip For Organizing The Fridge: Put loose jars in tubs to organize your fridge. Just pull out the tub to quickly find what you want. More Kitchen Goodies: 50 Quick Tips For The Kitchen, Cookbook Lingo: 101 Cookery Terms & Definitions, Use Mason Jars With Your Blender, 21 Free Kitchen, Household & Crafty Printables and Hidden Feature On Foil & Plastic Wrap Boxes?. 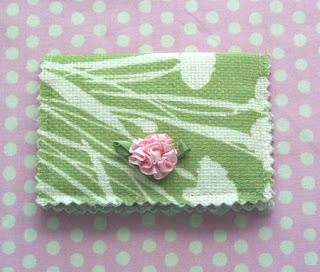 Here is the Household Notebook that I set up with my prize from Marcia at the Organising Queen. I got that put together this Sunday. I am really going to like this! I added a couple of extra pages for projects. I love the dividers that I found at WalMart and the last divider has a pocket! Yesterday and today, I have worked on kitchen cupboards and drawers. I should have taken a picture of all the plastic forks and spoons I threw out! They were loose in the back of my silverware drawer. I put a narrow storage container in behind my silverware divider and only the plastic ware that fit in there did I keep. I use them for our lunches and sometimes when I have several grandkids over and we are eating outdoors. Now I need to let you know that there is one area that I have not been able to keep up yet. It is the top of my washer and dryer. Remember the critter in the laundry closet? Well, some of the things that are going to go back in have had to be stored on top of the washer and dryer for the TIME BEING! ONLY until I get the closet organized. This morning when I got up, I went for the closet first. We thought the visitor was gone but after the first thunderstorm on Saturday night, it was very apparent that he was still around and now on the next shelf up! GRR!!! I had just washed the lower shelf and was getting ready to get it started! So back on hold, mousetrap back in play. Now where was I? Oh yes, this morning... closet... opening the door..... yeppers, he had returned but he won't be back. I backed up and shut the door and left it for Doug when he got home from work! OK. He is gone and one trap is left to make sure there is not more then one. By this weekend I am hoping to get back on track with this project. The great thing about this challenge is that you learn to adapt! I am on the road to success and I am going to stay there. I started to work on our household cupboard tonight but when I opened it up, it was too overwhelming! HA! But it was 9 PM too. So tomorrow or Wednesday it will be my project right after dinner is done. This will be an interesting one. I have to share this idea. This is a fabulous idea! This is chalk paint on the inside of a cabinet! Click here for the original post! The picture is not mine it belongs to this blogger! Even without children at home anymore, I like this idea and agree that it helps eliminate clutter! 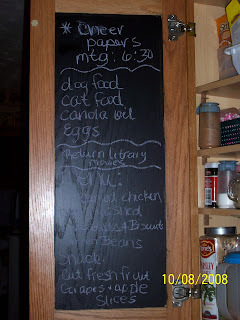 Recently, I had determined to get my household under control! It just seemed like I had let things gradually get out of control. Everytime I started to declutter and organize, I would get overwhelmed and stop in the middle and not get it finished. I would start on one project and in the middle another project would rear it's ugly head and I would have all these pots in the fire and not enough hose to put them out! I had just embarked in this journey when a challenge came my way! Marcia, the Organising Queen, threw out a decluttering challenge! I took the bait and decided to use this challenge to help me get into the "groove." It got me focused. One item at a time, one "spot" at a time! Then I saw what Marcia decluttered. One purse! Oh my, I was so much farther behind than that! lol But that was ok, because it set the example. Obviously this new friend had gotten to this point to where decluttering was a habit and I could get there too! So, I took before pics of areas in the house that I wanted to do. Some small and some big and a "plan" was hatched. The larger projects for weekends, the smaller for weeknights after work and for when I was/am babysitting the grands. Hence, the household schedule took birth! And the decluttering is still going on, but there became that point of seeing something out of place in my newly cleaned area and picking it up immediately before it "grew" and putting it back into place. This has taken a monkey off my back (and I don't mean my husband!) In this decluttering journey, I have found others who are in the same and different stages of decluttering their life. We have been able, thru the internet to be able to encourage and cheer other on. Bonds of friendships have been made. Our families have seen the difference and caught the spirit! 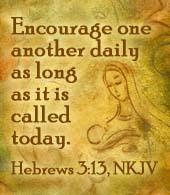 So I want to encourage YOU. Sometimes we feel overwhelmed by the clutter in our lives. And we get discouraged and feel like we just are never going to change. And clutter can be different things to all of us. It could be those pesky weeds in the garden bed by the front door, or it could be thoughts or worries cluttering your mind, dust bunnies under the bed, spices in the cabinet, appliances cluttering the kitchen counter, papers piling up in the office space, papers sticking out the file cabinet, recipes in drawers, etc. (Does it sound like I might have some experience here?) Nothing is beyond our reach! Find a system that works for you! Make a list and take it slow. Take baby steps. Don't let the bookshelf in the room call you away from the task at hand. But you can do it and you can succeed. If I can do it, believe me YOU can do it!! 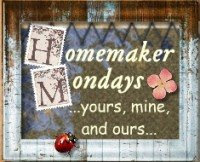 This post is part of a fun blog carnival: Homemaker Monday - Click here to see what others are saying this Monday! Wordless Wednesday - Bubbles I am Blowing! PLEASE READ! THIS IS IMPORTANT TO ME!!! Free download for storage labels! Thank you, Marcia, Organising Queen! I have a family of hams! Some changes at my work place!